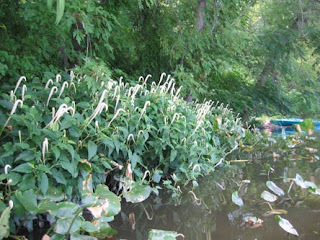 Some native wildflowers are easiest to see by boat in mid-July. Buttonbush (Cephalanthus occidentalis) leans out over the water with its golfball-sized blooms. LizardsTail, with the comically unpronounceable scientific name of Saururus cernuus, lines portions of Carnegie Lake's shoreline. 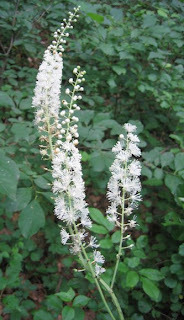 Meanwhile, similar spires, of Black Cohosh, rise up on the boulder-strewn slopes of Princeton's ridge, in Woodfield Reservation. While growing native plants, I've also been growing some jazz compositions, which was my habit back when I was a professional jazz musician. I'll be performing them on saxophone at the Princeton Public Library this coming Thursday evening, with help from pianist Phil Orr and bassist Jerry d'Anna. Titles include The Case of the Kidnapped Kalypso, Fresh Paint (composed while breathing latex fumes in a freshly painted room), Lejos de Aqui (Far from Here), Lunar Eclipse (composed while forgetting to check out the lunar eclipse that was going on outside), and For the Prez (inspired by last fall's election, and also the great saxophonist from the Count Basie band, Lester "Prez" Young). I call it sustainable because the music is all locally grown, with notes that have been used before, albeit in a different, even fresh, order and rhythm. No virgin timbres were harvested in the making of this music. The performance is free and lasts about an hour. We'll either be out on the plaza or in the library's community room. There's been an air of anticipation the past couple weeks as some of the biggest and brightest wetland wildflowers have been getting ready to bloom. These are some of the buds quickly developing in the July sun. 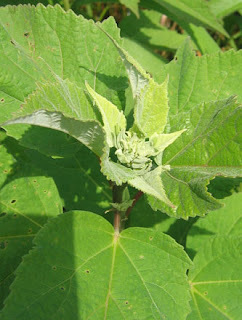 The first photo shows the buds of Joe Pye Weed. 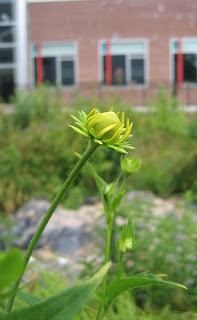 Cutleaf Coneflower, just starting to open. 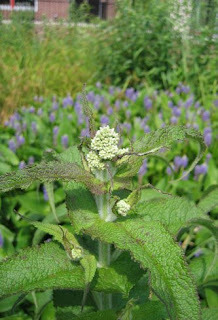 The beginnings of Boneset flowers, with pickerelweed in the background. 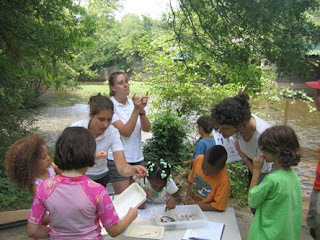 Photos were taken at the Princeton High School ecolab wetland, tucked inbetween the two new wings of the school on Walnut Street. If you're out for a walk, the wetland makes for a nice visit. There's a sidewalk all the way around it. The canal towpath, between Harrison St. and Washington Rd. is another great spot to see many of these flowers. We went to the river, and what did we see? We saw little mayflies, at least two or three. We saw dozens and dozens of little green caddisflies that live in the water before they can fly. 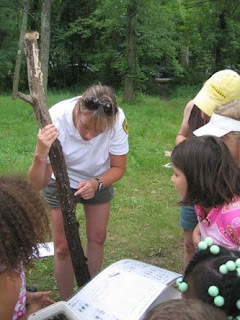 We saw crayfish, small and larger, scuds that skid about on their sides like shrimp. 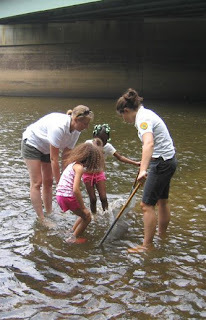 We saw tiny leeches-a-plenty, and even a free-wheeling freshwater eel. And how did that make us feel? Well, fascinated, mostly, with all the slippery sublime that can be found beneath rocks and riffles in the Millstone River, a pebble's throw from Route 27 in Kingston. 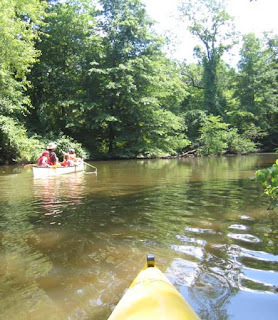 For two hours, it made kids of us all, catching the river's mysteries in a net, spilling the contents into shallow dishes of water, and then peering at all the minutiae of river life. There was some science involved, since each kind of creature can tolerate a different degree of stream pollution. The presence of mayflies, for instance, which have a low tolerance for pollution, speaks well for the river. Since the intake for Princeton's drinking water is twenty miles downstream, I like the idea that mayflies find the water clean enough to live in. One of the finer ways to spend a July 4 afternoon is on the grounds of the Princeton Battlefield. 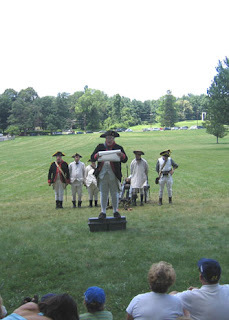 Chances are, you'll see historian John Mills, who in stature, bearing and voice seems the very embodiment of 1776, offer a detailed account of the Battle of Princeton, and then don spectacles to read the Declaration of Independence. It's also a good place for a native plant lover to feel ambivalent about the extraordinary expanse of mowed grass. It makes for a great feeling of openness and freedom of movement. On the other hand, it has nothing to do with the history of the place, and is surely a budget drain to mow. Other historic sites around the country have started to manage for more authentic vegetation. One approach would be to keep a portion of the grounds mowed, while planting the rest to the sorts of native grasses and wildflowers that have more to do with the land's history. Some of the grounds are already managed this way. 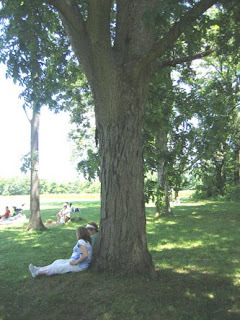 Most everyone knows about the Mercer Oak, whose offspring now grows in the middle of the field near where the original white oak once stood. There are some other interesting trees there as well. I'd heard that the grounds include two Hicans--a cross between a hickory and a pecan. The bark on the tree in the photo looks like a hickory for the first eight feet, then switches to pecan-like bark further up. Strange. Closer to Clark House are a couple chestnut trees. 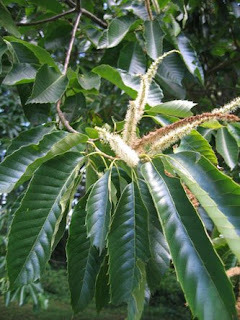 These are Chinese chestnuts, not the great American Chestnut that once filled our forests and provided abundant food until the imported chestnut blight took its toll. The Battlefield would be a great place to reintroduce the American Chestnut, survivors of which have been bred to resist the blight. Some other interesting trees, just behind the Clark House, are some very tall, statuesque black locust trees. Hidden in full view in the middle of Princeton Township is Pettoranello Gardens, where there's a pond, walking trails and a stage for summer concerts. 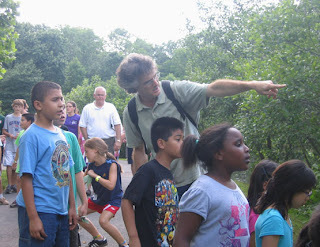 Last week, Robert Olszewski, youth director for nearby Westerly Road Church, brought his summer camp kids over for a little introduction to the park and its resident plants and animals. I served as tour guide. We started with sassafras, a fragrant native tree once used to make root beer. They then got an introduction to jewelweed, with its spring-loaded seed hurling mechanism and the metallic sheen its leaves acquire when put underwater. Though there was a very enthusiastic, cacophonous response to my offer of ten dollars to anyone who could spell "Pettoranello", the greatest attention was paid to twenty turtles clustered on what looked like a hay bale on the far side of the pond (photo). 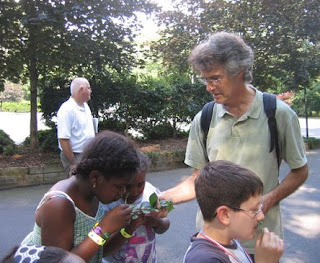 Before they headed back, I left them with a "don't forget to smell the spicebush" moment. Hopefully, the kids will serve as tour guides to their parents, and a few more families will get acquainted with this pretty spot in the middle of town. 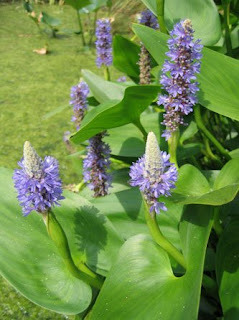 Pickerelweed blooms all summer long, and likes its feet in water. 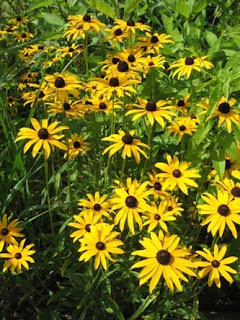 Black-eyed Susans were bought from Pinelands Nursery and planted in drier areas of the wetland several years ago. It grows naturally in the meadows at Tusculum in Princeton. 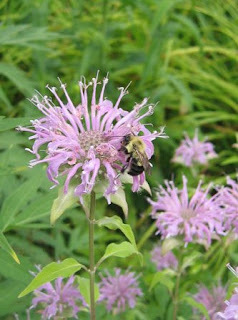 Sweet Bergamot, rather than its red-flowered relative Beebalm, is native to the Princeton area. 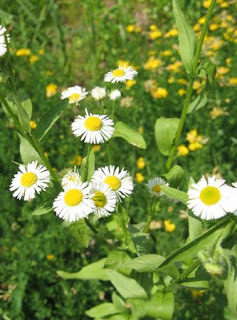 Daisy Fleabane, a weedy but attractive native that shows up of its own accord. 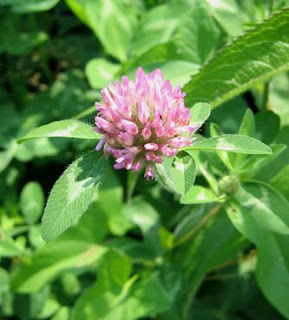 Red Clover, though not native, is not invasive. This arrangement showed up on our dining room table a few days back, and is as good a way as any to sum up what's blooming right now. Tall Meadow Rue is the white background. Beebalm in red. 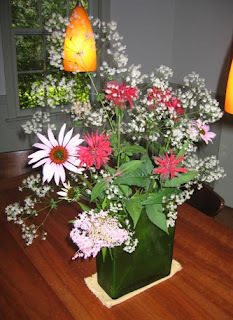 The daisy shaped flowers are purple coneflower (though a native, I've never seen it growing wild). And then there's some Queen of the Meadow (Filipendula rubra) washed out by the flash down at the bottom. Of these, only the Meadow Rue would be encountered growing naturally in Princeton's nature preserves. Native plant lovers have long faced a conundrum. If urban and suburban landscapes are so dominated by exotic flowers, grasses and shrubs, how will Americans ever encounter America's glorious natural heritage on a regular basis? One spectacular way just became available in New York as of June 8. 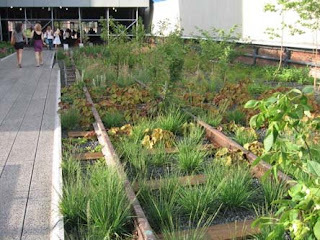 A section of the old, abandoned rail line on the west side of Manhattan has been refashioned as a pedestrian way planted with a rich variety of native flora. The irony is pretty rich, too. You'd think that these native plants would need some sort of "natural" habitat to survive, but many of our natural areas aren't really natural anymore. Most of these plants would quickly die if planted in a typical nature preserve, where they'd wither in the dense shade or be eaten to the ground by overabundant deer. Trees and deer are natural, but we've banished the fires and predators that once held their density in check and allowed sunlight to reach the ground here and there. 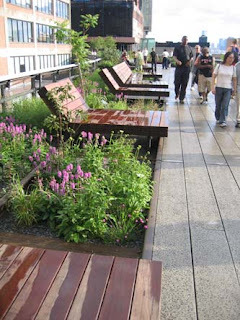 The low-growing native species in these photos need sun, and they get it here, thirty feet above the streets of New York. In Princeton, the story is very similar. The native species that need sun are thriving in places highly altered by humans--along the canal and at Princeton high school's ecolab wetland. Here are some plants to seek out for good smells, food and entertainment in Community Park North. The first one, Spicebush, is Princeton's most common native shrub. It has thick, dark green leaves, and if you pick a leaf and crumple it up, you will be rewarded by a wonderful citrony smell. The shrub's berries, hidden along the stem and still green this time of year, will help with identification. 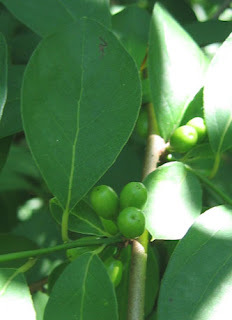 Spicebush is related to sassafras, a tree whose roots were originally used to make root beer. It also grows in the park, and has fragrant leaves that come in three shapes, one of which looks like a mitten. 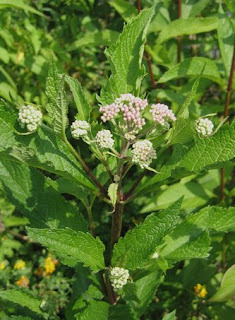 Along the nature paths, you'll likely see a brambly plant with a whitish bloom to the stem and clusters of green, pink, red and black berries. 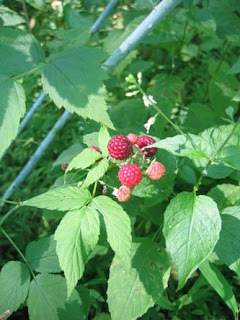 This is the native black raspberry. The berries are pretty tasty after they turn black. Watch out for the thorns, and be sure of identification before eating anything, of course. One of the funnest plants in the woods is the jewelweed. Try picking one of its swollen seed pods (just above the orange flower in the photo) and see what happens. Also, try putting one of the leaves underwater and check out what happens to its color. 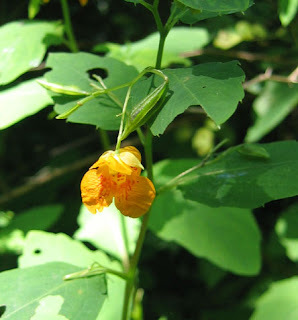 Jewelweed is a wildflower that grows in low wet areas, which is often where poison ivy grows. 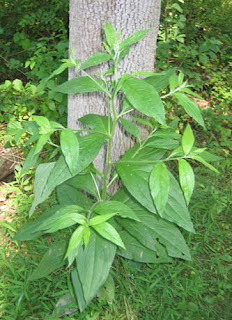 Conveniently, the juice of the jewelweed stem can be rubbed on skin to treat poison ivy. 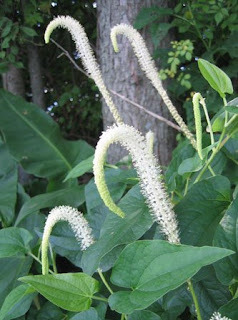 One plant that you may want to avoid interacting with, but which definitely wants to interact with you, is the stickseed. Later in the season, it grows green seed burs that will coat your pants if you happen to brush against a plant. It's clever "schtick" is to use you to spread its seeds.